Journey across the country in style and comfort with the 2018 CrossRoads Sunset Trail Grand Reserve 28BH Travel Trailer! At National RV Detroit in Belleville, Michigan, we are one of the nation's top full-service RV dealerships, and we've been selling all of the top brand RVs since 2008! For an amazing deal on a new or pre-owned RV, we can't be beaten! So go online and check us out, then come in and let us help you find the perfect RV for you and your family! We're conveniently located at 44700 N I 94 Service Dr Belleville Michigan 48111, and our friendly, courteous staff are always ready to assist! Even if you don't live in the Belleville area, or in Michigan at all, we offer personalized phone and internet service, and our 24/7 delivery anywhere in North America means you can buy your dream RV today at a dream price, and have it delivered to your door tomorrow! Give us a call at 734-439-3400 and we'll turn your dream into a reality! With a hitch weight of 656 lbs. and a GVWR of 7600 lbs, the CrossRoads Sunset Trail Grand Reserve 28BH is easy to tow and go! The 20' 0" patio awning provides shade and UV protection during outdoor living! Stay cozy in the master bedroom with its Queen bed! 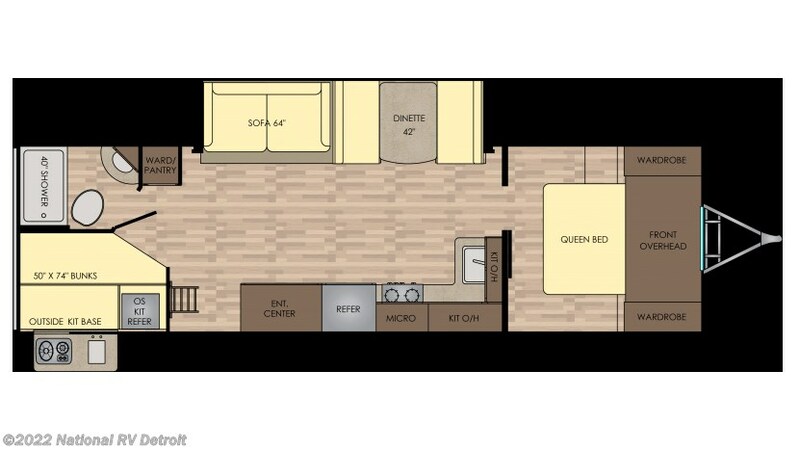 A family of up to 9 people will find comfortable sleeping accommodations inside this RV! Making your family great meals on the road can be challenging, but not in the CrossRoads Sunset Trail Grand Reserve 28BH with its super kitchen and suite of modern appliances! You'll cook up delicious, nutritious meals on the 2 burner range cooktop, while the roomy 7.00 cu. ft. refrigerator can stock all your favorite fresh foods and beverages! You'll be able to clean, drink, and cook with plenty of water from the 45 gallon freshwater tank! andnbsp;Kids will love lounging and napping in the cozy bunkhouse, which features extra comfy Bunkbeds!andnbsp;Sunshine and happiness shouldn't be missed because you need to cook lunch inside the kitchen. Thankfully, this RV has an outdoor kitchen too! Check out Stock # 6067 - 2018 CrossRoads Sunset Trail Grand Reserve 28BH on crossroadsrvsource.com!